Parents from different cultures have different ideas about how to name their children. Some differences are because of culture rules; some are because families are different. Many parents think seriously about the names they select. They want to name their children something that is meaningful. Some parents name their children so their names sound similar. Some of them think that it’s a way to remember their children’s identity. 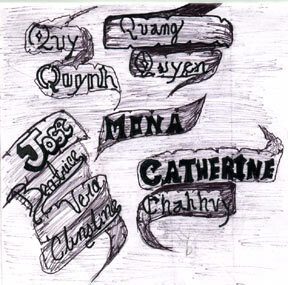 Quy Nguyen, the father of Quynh, a Blair student, had an interesting plan for naming his children. “I gave all of them their names all starting with the letter Q because the first letter of my name also starts with the letter Q,” he said. His son is Quang and his other three daughters Quyen, Quynh and Quyen Nguyen. “I gave them that name hoping that they will follow my footsteps and be successful in life,” Quy said. Many children were named after someone the parents like, maybe hoping the children will be like them. Kafia Ibrahim who is from Somalia, said that her mother named her after her best friend’s daughter because that girl does everything in her house. “My mother uses her as a role model for me to follow,” Kafia said. Her mother also thought about the meaning of the name. “Kafia means queen of the house because I have seven brothers, and I am the only daughter,” she said. Mona Boursiquot from Haiti has a similar story as Kafia. Mona stated that her mother named her after her mother’s best friend because her mother likes her friend’s personality. Sometimes people’s name represents something meaningful to them such as their as personality. “My name means lovely, darling and pretty,” Mona explained. Jose Guzman from El Salvador said that his name is the name of Jesus’ father. Some parents practice different ways to name their children. Beatrice Walker from Germany stated that her dad gives three names to each of his children. He wants to give his children an opportunity to pick their favorite one out of those three names. She herself has three names: Beatrice, Verena and Clinstine, but she chose Beatrice for her document name. “I chose Beatrice because it is not a common name in Germany and it means happiness,” she said. Her dad thought that it was a unique way to give three names to each child and have them pick one out of those three names. There are some students who have different names in different places or with different people. For Catherine Lee from Cambodia, at home her family calls her in a Cambodian name, Chahhvy. Catherine’s Cambodia name Chahhvy was her original name before she came to the United States. She said, “I changed my name to Catherine when I came here because it’s easier to use in school, but my family still uses my Cambodian name.” Catherine likes her Cambodian name because it has special meaning. “I still use Chahhvy because my grandpa gave it to me and it means the six colors,” she said. Accidents changed some people’s names. Julmira Ie says that her original name was not Julmira. Her original name was Zulmira. Her name was changed by an accident before she came to the United States. “When my family went to apply to come here, my cousin accidentally spelled my name with the letter J instead of the letter Z on the document,” she said.